A new breed of high-tech fitness trackers that measure everything from overall movement, steps and even sleep patterns are likely to be showing up on your friends and relatives this year. Whether meant to be worn on your waist, dropped in your pocket or strapped to your wrist, these gadgets work in concert with smartphone apps and websites to help you set goals, then motivate you to achieve them. Gone are the oversized clumsy; often goofy looking trackers replaced today by devices that are fashionable and versatile. One of the overall favorite trackers of 2014 is the Fitbit. This is a double positive because not only can you track information and become your own personal quantified self, but you can also connect your Fitbit device to Healthy Incentives’ StayWell Time Out for Health. –It’s super easy! You can learn how that works here in our video tutorial. King County Employees can now get a discount on their FitBit. Learn the details here! I had the opportunity to talk to three people in HRD who are currently using a Fitbit for their Healthy Incentives Individual Action Plan. “Overwhelming positive experience” says Annmarie when we sat down to chat. “I put on my pants, a shirt and my Fitbit. It’s just part of getting dressed in the morning”. She also told me about some of the fun features Fitbit offers. “They incent you really well. I was having an inspiring day; I had 17,000 steps my reward popped up. They were smiley faces, a movie of inspiration and a badge. “It’s easy, fun, and you can compete with yourself; you don’t ever not want to do it. I will take a walk; take the stairs, anything to get more steps!” Speaking about the cost of the Fitbit, AnnMarie admits she was hesitant to take the plunge to spending the money. She said “I just would not have believed the value. It is totally worth the cost – but I just would not have known that before I had one.” (Lucky for AnnMarie, she won her Fitbit in a contest). AnnMarie’s advice for others considering getting their own Fitbit: “I encourage anybody who struggles to get exercise into your schedule to get one. It’s easier to walk 10,000 steps than you think”. Karleen’s kids gave her a Fitbit Force for Christmas. She loves her Fitbit because “you don’t have to do anything special – just wear it”. Karleen set a goal to get 7.5 hours of sleep per night in the goal setting class earlier this year. “It’s a goal I have had for a long time, but I hadn’t attacked my goal.” Karleen is now not only attacking her goal, but succeeding! the dog is walked”. And the Fitbit helps. “My record is my Fitbit. I set the start (of sleep) and the end when the alarm goes off and it’s time to get up. It’s all there, and then it just uploads into my computer and the app on my phone where I can see my sleep record.” It is making a difference and Karleen is meeting her goal of getting 7.5 hours of sleep. Something she didn’t think was possible. And as an added bonus, Karleen is also using her Fitbit for her Healthy Incentives. “For my individual action plan – I go into my Time out for Health account and there are all of my steps! It’s super easy and every step is recorded”. Greg has a brand new Fitbit The Zip . He is wearing it every day, and he loves “quantifying my work day”. 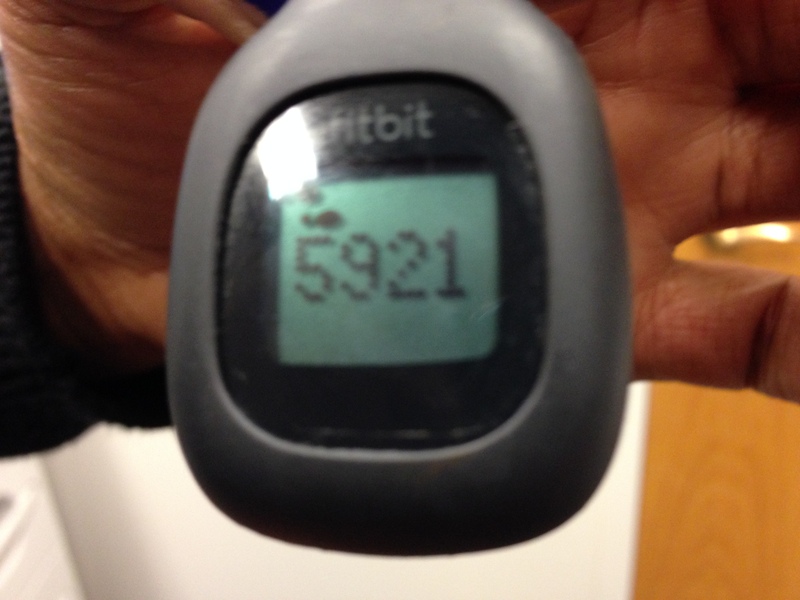 Greg told me he was curious to know just how many steps he takes in a day going back and forth to and from the printer. activities on his phone through the Fitbit app. “It’s a simple way to do Healthy Incentives. It’s logging and registering your activity for you – that’s great”. I asked Greg what has changed for him since getting his Fitbit earlier this month. Greg replied: “I am walking more. I took the stairs to the DES meeting while everyone else was waiting at the elevator”. “I will get off the bus two or three stops early and walk to my car….even in the pouring rain and cold. And a couple of times I have been out in the front of the house with the dog walking up and down the driveway; just to reach my goal. This is my own little thing. It’s the best pedometer…I use it for my healthy incentives and what’s so cool is that it’s seamless. It’s the easiest way to get credit for what I am already doing”.